Animated GIF to sprite sheet using ImageMagick – Nick. Although animated GIFs are easy to place on a basic webpage, it turns out that they aren’t so great for scripting (since you don’t have much control over playback). Sprite sheets are better in this regard, since you can have pretty fine-grained control over the animation. So I searched for conversion methods and found this very useful TIGForums post explaining how to generate sprite sheets from animated GIFs using ImageMagick. Unfortunately, it looks like there are bits missing. The problem was that the animated GIF was optimised to use “combine” mode. This means that the image stored for each frame only includes pixels that need to be changed from the previous frame. What is the deal with that? 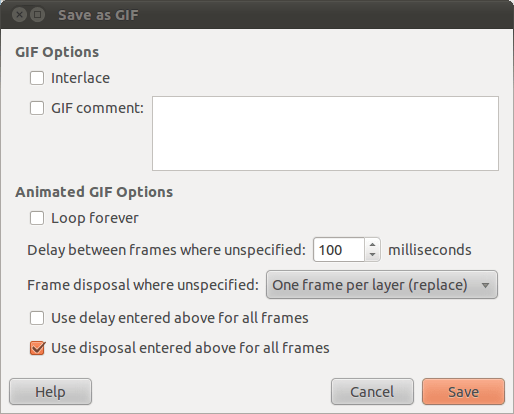 I checked the GIF image exported by GIMP and it’s there as well. Gah. It must be a bug in GIMP. I was totally struggling with this weird gif behavior, thanks for the repair! montage: unable to open image `@Users/ran/Desktop/Coin.gif’: No such file or directory @ error/blob.c/OpenBlob/2709. How do I fix it and make it work? Thank you for this … had me stumped till I read your article as my “spinner” would show up as a bunch of random “arcs” instead of a spinning circle.